Advair FOR SALE » Discount NoRX Pharmacy » What Goes Into an Emergency Preparedness Kit for Short Term Disasters? In our preparedness planning, it is important that we go beyond food storage and consider other preparedness essentials. While food and water storage is critical, we should also look at preparing for potential short-term and long term disaster or emergency situations. Our preparation efforts may very well determine our ability to survive. Emergencies (or disaster situations) can typically be classified as either short or long term. You may deal with short-term emergencies - such as losing power for a day or having a health emergency. These short-term situations usually pass fairly quickly. Even though these tense situations may pass quickly they can still be life-threatening. When something causes a short term emergency, unless you’re prepared, you could find yourself in a bind, putting yourself and your loved ones at risk. Weather emergencies such as floods, hurricanes, tornadoes and blizzards are the top four causes of short term disasters that people are forced to deal with. These disasters create situations where you can end up without any lights, heat or air conditioners. Depending on your location and situation, losing electricity for a short period of time could be a potential life-threatening situation if you are not properly prepared. Without electricity, you will not have a way to keep your food supply from spoiling. If the disaster causes a rush on grocery store supplies, there will be empty shelves, leaving you without a way to get food. Without electricity, you can lose the ability to call out for help for health reasons or if there’s looting and the battery on your cell phone dies. The time to plan for a disaster is right now - while you have electricity - while you have the food you need and the means to get ready for what might come your way. 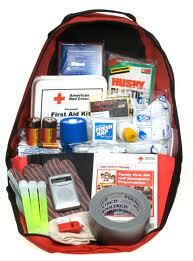 One of our suggestions is: Prepare yourself now, and make sure you have an emergency preparedness kit. In that kit, you need water for every member of your family and enough food to last everyone for at least a week. You’ll need a way to keep warm - especially if the disaster is during the colder months. Use thermal blankets and waterproof sleeping bags. Have battery powered or solar powered gadgets that can charge cell phones. Have flashlights and radios on hand that run on batteries and keep extra batteries ready - or, invest in the hand crank variety. Make sure you have a first aid kit that includes bandages, face masks, antibiotics and all other prescription medications you may be taking. Prepare your kit with infant and pet needs, too. Keep antibacterial wipes with the kit and have your personal ID copies in with the kit. In case your originals are destroyed in the disaster, you’ll have a backup copy that will save you from a future hassle. You’ll need matches, a hand held can opener and a multi-tool as well as a whistle. A whistle can be heard over long distances and can make it easier to locate you if you are injured or become lost during an emergency. Keep all of your supplies together in an air-tight waterproof container and store the container somewhere that the temperature doesn’t vary. There are places that offer ready-made disaster kits - and some people choose to buy those. If you pick that option, don’t forget to add copies of your important paperwork and personal medications since a ready-made kit won’t come with those. Well, I don’t have a family so I’m just gnsiseug. I’d probably go to REI or some sort of camp/sports store because they have cool gadgets like water filters and maybe those butane burners. And possibly get those food dehydrators and dehydrate a ton of food; liquids weigh too much. And basic sewing kit, basic emergency kit (I’ve never had to use one), It depends on a lot of factors, but if there were still grass and trees or if I were in an area where the ground was comfortable, I probably wouldn’t really have a tent. But some lightweight material of a blanket just in case of cold nights; again I’d probably find something like this at REI. There’s a lot of factors to consider, and guess if it is apocalypse, you don’t really know what to expect. I also don’t have kids, and am purely basing on if the kids were like me and could handle discomfort.